In the Nashville area, pools generally open Memorial Day weekend. If you haven’t found a place to swim and sun yet, following is a list of outdoor pools and beaches near Brentwood. Included here are public pools in Nashville (Davidson County), and various parts of Williamson County. Williamson County residents have 3 great outdoor swimming pools to choose from. For cost and convenience, the YMCA pools in Middle Tennessee are hard to beat. Franklin YMCA on S. Royal Oaks Blvd. The traditional Brentwood swimming spot is the Brentwood Dolphin Club on Wilson Pike. It looks a little rough around the edges compared to newer pools, but its location makes it convenient to many of Brentwood’s older subdivisions. You can head to public beaches on Percy Priest Lake, within 30 minutes of Brentwood. There’s a sand beach and playground is available for a nominal Day Use fee. Also available: picnic sites, group shelters, boat launching ramps, and bathrooms. Pets are not allowed. There’s a sand beach and playground available for a nominal Day Use fee. Also available: picnic sites, group shelters, boat launching ramps, and bathrooms. Pets are not allowed. If you’ll be camping, then Seven Points Campground on Percy Priest Lake has a sandy beach that is available for registered campers and their authorized visitors. Pets are allowed on a leash. I just explored the Anderson Road beach for the first time with my family. Read about our Nashville beach trip, including my recommendations for other Middle Tennessee lakes. Of course, there is always Percy Priest Lake’s Nashville Shores — which combines slides, pools, and sandy beaches. The price for admission may not be worth it if your children aren’t old enough to enjoy the slides. But here’s a tip: search for Nashville Shores coupons! 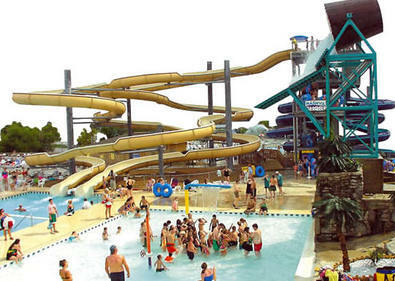 It’s fairly easy to find discounts for this awesome waterpark — especially pre-season and end-of-the-season. And if you’ll be going to Nashville Shores at least twice this season, then consider a season pass — the price is worth it for those who plan to make multiple visits. For a cheaper waterpark option, Metro Parks & Recreation operates Wave Country — a pool with water slides near Opry Mills mall. I’ve heard that the newly renovated Wave Country is much improved, and children 2 and under are FREE. Metro Parks’ Centennial Sportsplex has a nice indoor swimming pool (for a fee). Many of the other Metro Parks pools are FREE to Davidson County residents. Just be sure to check the hours carefully ahead of time, because the public pools open and close at odd times. If you know of another great place to swim in Nashville or Brentwood, leave me a comment and let me know!